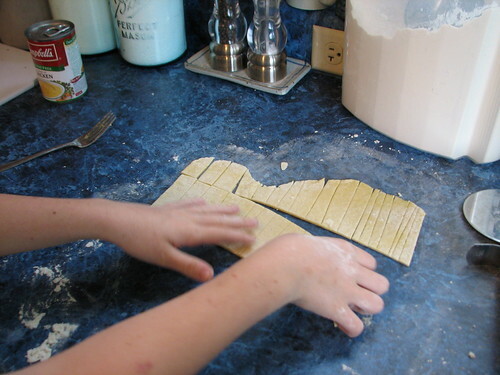 DD was excited to try her hand at making the noodles for supper for last night. 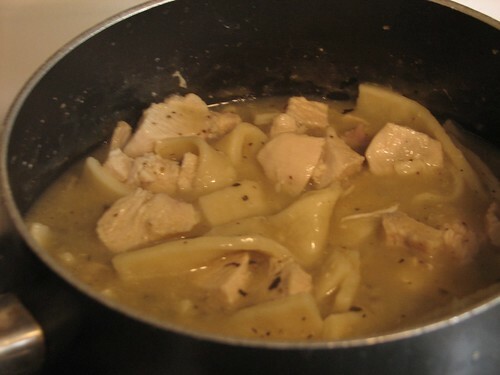 After simmering the chicken (in enough water to cover, with some dry onion, garlic, celery seed, about 1 tsp basil, 2 tsp chicken bouillon, and salt and pepper), I diced it and returned it to the broth, which I brought back to a boil. 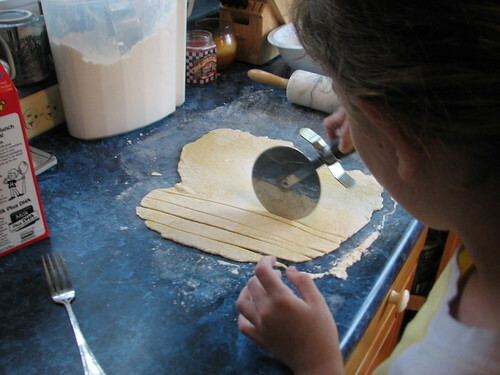 DD gathered the noodle ingredients and made the dough. She did all the work except for the last of the rolling. 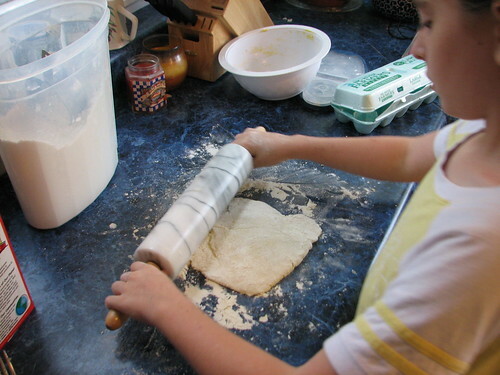 It was hard for her to put enough pressure on the dough to make it thin enough. She enjoyed cutting them…thought that was fun. She even did the work of dropping them (carefully!) into the boiling broth. I added one can of cream of chicken soup to the mix. Delicious! And we had enough left over to share with a friend. 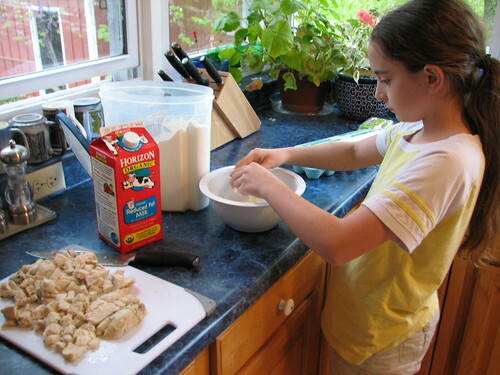 DD enjoys cooking and we’re going to try other cooking lessons this summer. Teaching her to make noodles was not hard at all. And she really enjoyed eating them after she had made them herself. We’ll be making them again soon, I’m sure. Added note…we’ve made these many times since. Easy to make and delicious with chicken or beef. 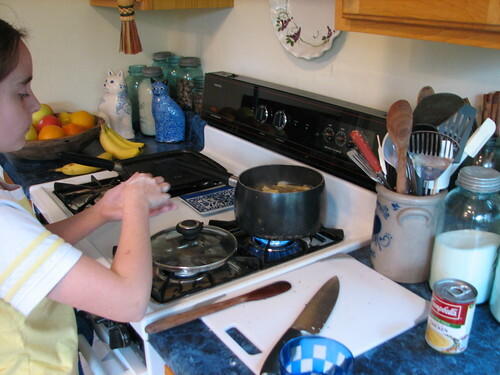 This entry was written by ~~Rhonda, posted on May 7, 2008 at 4:39 pm, filed under family, Recipes and tagged chicken and noodles, cooking, DD#3, kitchen, recipe. Bookmark the permalink. Follow any comments here with the RSS feed for this post. Post a comment or leave a trackback: Trackback URL. What a great job your dd did! Reading about the noodlemaking reminded me of a series of books I recently read where the main character made homemade noodles. I remember being amazed that she would hang them over her arm so that they would stretch! 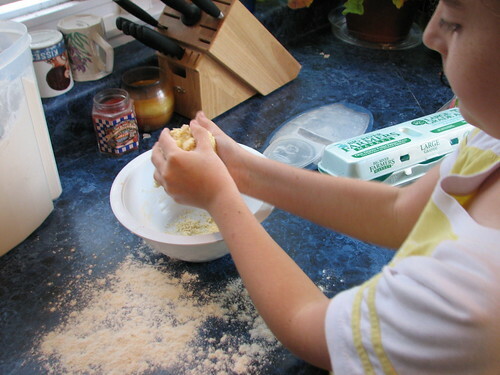 I have a ds a year or two older than your dd (he is 11), and he enjoys cooking. I might try making chicken noodle soup with him now…thanks for the idea!